Leading international physicists met in Madrid on November 25 to celebrate the centenary of Albert Einstein’s theory of general relativity. A theory that continues to fascinate all who study it. How did the 20th Century’s most popular scientist hit the nail on the head? 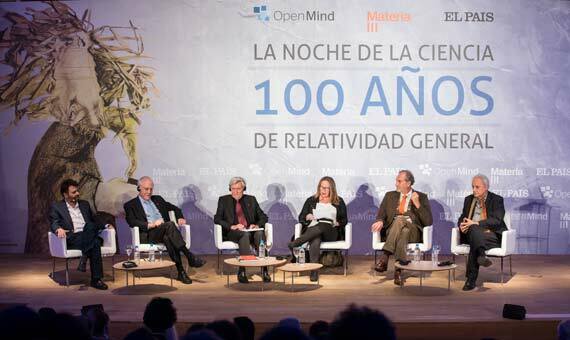 Thanks to OpenMind, Materia and the El País newspaper, 5 top physicists met on the same stage to answer this and many other questions about Albert Einstein and his science. José Luis Fernández Barbón, a scientific researcher at the CSIC/UAM Theoretical Physics Institute, David Gross, theoretical physicist and 2004 Nobel laureate for physics, Hanoch Gutfreund, professor of theoretical physics and former President of the Hebrew University of Jerusalem, Manuel Lozano Leyva, atomic, molecular and nuclear physics professor at Seville University and Jean-Pierre Luminet, astrophysicist and research director at CNRS, all took part in a debate moderated by Patricia Fernández de Lis, Director of Materia. What is space and time? Quantum physics, gravitational waves, black holes,… All these concepts at one time or another ran through Einstein’s mind. 100 years after his theory was published, we try to fit the puzzle pieces together with the help of today’s leading experts. To celebrate science is to celebrate the triumph of reason, with Einstein and his theory of general relativity offering the finest example.